We've been working on the global clean drinking water problem for 5 years now. In 2011 we launched our flagship product and immediately went down to Guatemala to see if our 48" RainSaucer could be the ultimate solution (see video). It was well received but the general consensus was the price needed to be lower for folks at the Bottom of the Pyramid. We also came to understand that without a cheap form of water storage, our efforts would be wasted because the total system cost would still be too high. So in 2014 we took another look at the problem and thought we might be able to do something at the $2 cost level. We had some initial prototype success with our cardboard "Two Dollar Tank" but in the end we just couldn't make it last more than one season. Yet we are not the kind of people to give up. And now we have a new concept: the $6 Cistern. The Six Dollar Cistern is a 150 gallon tank that both catches and stores rain water. The Cistern has two components: a ruggedized phthalate free 5' wide vinyl pool that costs $3 and a food-safe HDPE cover that can be made for $3. The pool cover has a filtered inlet for preventing debris from entering the tank and an outlet for pumping or scooping of water. The Cistern can be deployed either as a stand alone rain collector or as general purpose water storage. The main target is families at the Bottom of the Pyramid. The $6 cost means a final retail price of $10- putting it well in the reach of families earning $1-$2 per day. In countries where such families buy bottled water, the investment would pay for itself in less than one rainy season. In other places, the investment would pay for itself in terms of the productivity gained from improved health and reduced time searching for water. As a stand alone rain collector the Cistern will catch 12 gallons per inch of rain. So for example, in Guatemala where it averages 30 inches of rain per year the Cistern will catch 360 gallons, enough drinking water for a family of four for most of the year. Since the pool is inflatable and the cover can folded, it can ship in a box as small as 1/2 cubic foot enabling easy packing, shipping, and distribution worldwide. The first prototype was tested in the Summer of 2015 and was fully functional. 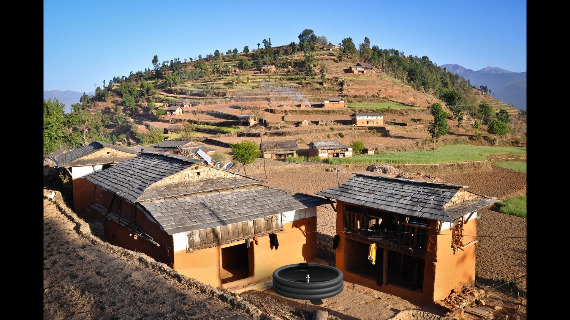 We believe that ultra-low cost, portable water storage would not only spark a boom in rainwater harvesting worldwide but that it would also have applications for disaster relief. In the event of an earthquake or tsunami, inflatable rainwater harvesting tanks could be deployed by NGOs on the ground to store initial supplies of water that would replenish themselves with rain. Future iterations of the Six Dollar Cistern could also be targeted at small plot farmers as a water storage source for drip irrigation. Please see the supplied photos. We welcome your feedback through our Contact page.